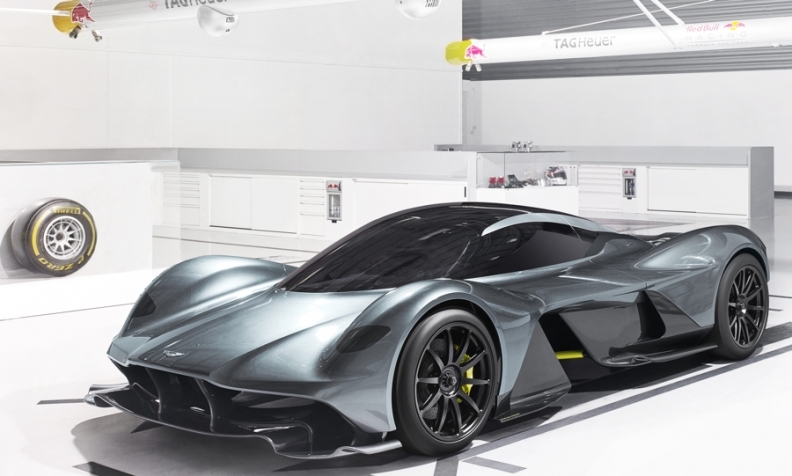 Aston Martin and Red Bull want their AM-RB 001 concept supercar to weight less than 1000kg and offer a power to weight ratio of 1-to-1. The production version will go in sale in 2019. Aston Martin and the Red Bull Racing Formula One team jointly revealed a supercar concept that is expected to offer up to 1000 hp from its V-12 engine and cost between 2 million and 3 million pounds ($2.6 million to $3.9 million) when it goes on sale in 2019. Production of the two-seat car, code-named AM-RB 001, will be limited to 99 to 150 units, Aston Martin CEO Andy Palmer said during the unveiling at the company's factory in Gaydon, central England, Tuesday. Palmer said the car was further evidence that the money-losing brand's fortunes were turning. “It really sends the signal to the rest of the industry and customers that the transformation we're going through is real. Watch out competitors,” he said. Track-only versions of the AM-RB 001 will match the performance of top-level Le Mans racecars, said Adrian Newey, who is Red Bull's chief technical officer and head of design. Instead of following McLaren Automotive and Ferrari in creating its own road cars, Red Bull teamed up with Aston Martin, which is one of its F1 sponsors, to develop and build the hypercar. It will be manufactured in Gaydon, where the automaker recently started building the new DB11 coupe. Newey said he preferred not to use a hybrid system favored by both McLaren for the P1 and Ferrari for the LeFerrari in a bid to keep the weight below 1,000kg. Instead, the car is powered by a naturally aspirated V-12 supplied by Aston. The partners said the target power-to-weight ratio for the carbon-fiber-bodied car is 1-to-1, meaning it will have a power figure close to 1000 hp.